The Beatles Through The Years: The Beatles First Appearance at the London Palladium. The Beatles First Appearance at the London Palladium. I wanted to talk about the fact that there is no footage to go along with this fantastic audio of the Beatles very first appearance on 'Val Parnell's Sunday Night at the London Palladium' in 1963. This appearance is what is widely regarded as the beginning of the Beatlemania phenomenon as a whole in Britain. It certainly attracted the attention of the newspapers who ran stories the next morning of the scenes inside and outside of the Palladium of screaming fans and fainting. Of course, the papers and journalists were months behind the times as this had been going on, in Liverpool at least, for 3 years already! But now the term 'Beatlemania' was coined (by the Daily Mirror, no less) and it was "Happening everywhere... even in sedate Cheltenham!" 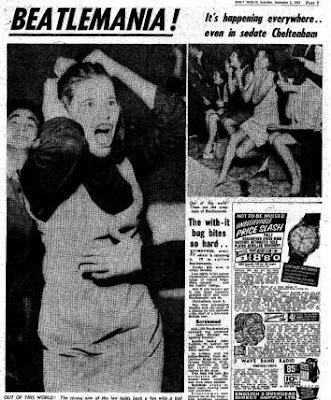 Beatlemania: The Daily Mirror noted that it was 'Happening everywhere' in November 1963. Sunday Night At the London Palladium was a variety show in Britain similar to The Ed Sullivan Show (that the Beatles would debut in America on in February of 1964) in the United States. The show usually opened with a performance from The Tiller Girls but this evening, the 13th October, the curtains went up and the Beatles appeared briefly. The place went insane! Host Bruce Forsyth (Yep, the same Brucey, he was the same age as Paul is now, back then!) tried in vain to quiet them and when they finally did he told them "And if you want to see them again, they'll be back in 42 minutes!" The audience, both at home and in the theatre, had to sit through all the other acts that appeared, which included Singer/comedian Des O'Connor and American R'n'B singer Brook Benton. After Des had done his bit, Bruce Forsyth came back out in a collarless jacket and Beatle wig, saying; "I thought I'd be a dead ringer for Ringo! Are you ready?! 5, 4, 3, 2, 1! Here they are! The Beatles!" and finally the curtains came back up and the Beatles performed. The songs they performed were; 'From Me To You', 'I'll Get You', 'She Loves You' (Their most recent hit) and ending with 'Twist & Shout'. Just before the last song, Paul's introduction was drowned out by the screams from the audience, to which Lennon screamed "SHUURRRUP!" to more screams and a round of applause from the older members of the audience who were no doubt getting extremely fed up of the teenage girls' shrieking and screaming. The Beatles performed once more on the show in January 1964 but after that, never again. ATV (Which was later to become ITV in Britain) produced the show and I was hoping that, since we all know about the BBC and their policy of wiping in the 1960s and 70s, that ATV wouldn't have done the same thing. Appears they did. Why? Well because back then, everything that was recorded was bigger and took up much more space and when colour TV came around in the late 60s. The BBC and ITV thought that monochromatic footage was of even LESS VALUE and they couldn't re-use the tapes and subsequently....destroyed the tapes. Yes people. The Beatles' appearances on BBC shows like 'Juke Box Jury' and 'Top Of The Pops' are missing, probably wiped. I can only imagine when the BBC started their archiving in the late 70s and discovered that almost all of their output from the beginning of television in the 1930s to the 1960s was gone, you could probably hear their collective heads banging against the wall. The footage is listed as missing and this audio was captured by a TV viewer who hooked up his record player to record the audio to vinyl. I'd like to say on behalf of Beatles fans everywhere, Thank you to everyone who experienced the Beatles first hand and recorded footage or audio of their appearances! Corporations like the BBC and ATV/ITV obviously decided posterity wasn't in their best interests! I always say that if I could travel back in time. I'd bring a camera and camcorder for the future! Very complete and useful. I am really impressed with your writing.